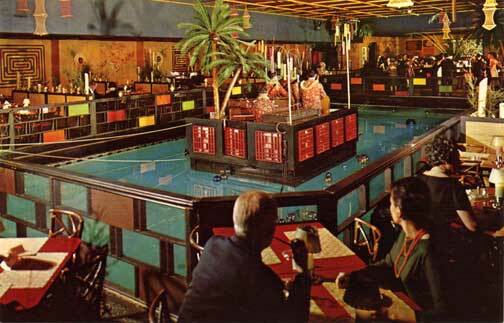 Who Cares About San Francisco’s Tonga Room? I do. The historic Tonga Room at the Fairmont Hotel in San Francisco, one of America’s last surviving Tiki Bars from the golden age is slated for demolition to make way for – you guessed it, that dirty word – Condos. The Tiki community and a group of SF preservationists have been trying desperately to keep the owners from closing it down, but the owners (and unfortunately for people like us who would like to preserve the past) have every right to do with they want with the property, and I agree they should have that right. The owners are adamant to remove the Tonga Room from their property in order to build new hotel rooms and condos, but are willing to carefully dismantle the Tonga Room, store the artifacts and help move it to a new location. Personally, although I believe it should be preserved as-is and could be a major profitable attraction, this is probably the best compromise that can be made. It’s just a shame that developers like these owners don’t realize that places like The Tonga Room are what make an area desirable to begin with – and once it’s all gone, who cares about living in their condos? Yes, the SFWeekly Blog staffer (not even sure if he’s on the payroll) who usually writes about sports or community events wrote a number of articles slanted heavily with his opinions about the Tonga Room and its impending doom. His slant was basically that it is nothing but an out-dated dump, a tacky catastrophe that should be plowed under and forgotten as soon as possible. A blemish on the nuevo-hipster world where clubs with numbers for names and cookie-cutter upscale condos rule. A ridiculous piece of grandpa’s past, an overpriced monument to crappy kitsch that interferes with progress. His last article, the one that asks if anyone cares, is a sarcastic, juvenile attempt to slander not just the Tonga Room but Tiki culture as a whole. Phrases like “historic preservation label slapped on postwar kitsch” and “tiki bars are relics of a bygone era” were cutting enough to enrage an entire population of preservationists and Tikiphiles…enough to foster 111 comments in just a few days, 99% of which were from people opposing his opinions. Now, let’s take a minute to be fair. The guy has a right to his opinion. The post was on a blog, not the front page of the SF Chronicle. He has the freedom to say what he wants, just like I do here. That said, let’s also be fair by saying that even though the article is published on the SF Chronicle’s blog, it’s STILL the SF Chronicle, a reputable newspaper that is committed to publishing real news along with editorial opinion – but traditionally, those opinions are based on well-researched facts, not the ramblings of some kid who just doesn’t care – or doesn’t get it. And that is the tragedy of this article; the writer doesn’t care because he doesn’t know what the hell he’s talking about. He assumes that because he doesn’t like original Tiki bars, that no one does. He assumes that because (possibly) his circle of influence is content to drink Vodka made in France (France???) and chain-store lattes, eat overpriced food at “trendy” restaurants and brag about it, and go into debt paying for cookie-cutter foreign cars just to show off, that the rest of us do. He should have done his homework. He should have done a few minutes of research on the net, and he would have realized that yes, there’s a big revival of Tiki Culture, and it shows no signs of slowing down. A few keyword searches would have shown him The Mai Kai in Fort Lauderdale, still thriving even in this recession, packed to the gills with people who come just for the experience along with people who are avid regulars. He would have found Trader Vic’s and Don the Beachcomber, and their world-wide success. 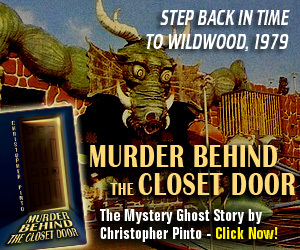 He would have found Otto’s Shrunken Head in Manhattan, or Taboo Cove and Frankie’s Tiki Room in Vegas, newly-constructed Tiki Bars built in the traditional way. (Taboo Cove had a great run at the Venetian. It doesn’t get ‘hipper’ than that). This individual, like so many people today, is using his platform to push his misinformed opinions and beliefs on the rest of the world. Well, 100+ comments on his blog show that the world is pushing back. If he wanted to make the point that the owners of the Fairmont Hotel are entitled to do with they want with the property, then he could have done so in a much more responsible manner. Instead, he blurted out his opinion as if the entire city of San Fran (and basically the rest of the world) agrees with him. That’s what we professional writers call ‘bad journalism’. Now, some of you may be saying to yourselves, “Hey Tiki Chris, ain’t you just blurtin’ out your opinions here? Ain’t that, like, the same gig?” Well, it’s a little different here, kids. First of all, this is a site for people who love Tiki, not a newspaper’s blog. Second, I’m not saying anything here that’s not based on fact. 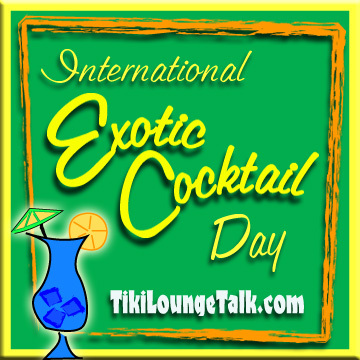 Millions of people enjoy Tiki bars around the world. Many of them would be sad to see our history pushed away to make room for condos. The owners of the Fairmont do have the right to plow it down, if they want. And the guy who wrote the article doesn’t seem to think anyone in the world likes Tiki Bars anymore, and that they should all be forgotten and turned into TGI Friday’s. Well, ok, I made up the TGI Friday’s, but it gets the point across. Can the Tonga Room be saved? Of course. Should it? Absolutely. Should the owners of the Fairmont Hotel included the Tonga Room in their renovation plans, and market it as a world-class attraction? Damn straight. But they haven’t, and they won’t. Hopefully the investors who’ve taken an interest in moving the room will be successful. Hopefully this piece of history and architectural wonder will be spared the wrecking ball and preserved for generations to rediscover and enjoy. Perhaps the kid who wrote that goofy article will learn a lesson from the comments. 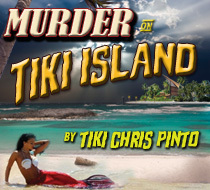 -Tiki Chris P, a little steamed, reporting from the newsroom at Tiki Lounge Talk, the Tiki Blog for people who believe in preserving our past and enjoying it to the fullest. A Final Note: Last year, the Sheraton corporation decided to renovate one of Fort Lauderdale’s most famous landmarks, The Yankee Clipper Hotel. This seaside hotel, built in the 1950s, looks like a cruise ship moored at the beach. 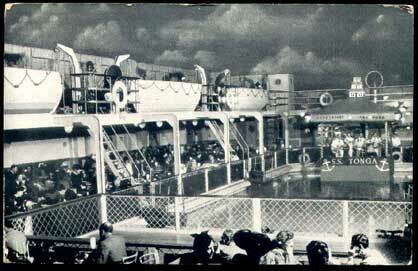 But it’s not only famous for its unique outer look, but for its lobby bar – called The Wreck Bar, this kitschy-fun lounge looks like the inside of a sunken ship. But what makes it truly unique is the portals that look out into the hotel’s pool, where people sitting at the bar can watch swimmers go by. For years this has been the site of the world-famous Mermaid show, where beautiful women with Mermaid tails swim by doing water acrobatics. 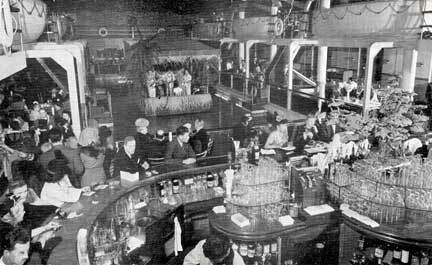 When the plans to renovate were announced, everyone assumed this mega corporation would remove the Wreck Bar and replace it with a modern, more trendy and dull lobby bar. Well to everyone’s surprise and to the Sheraton’s credit, they restored the bar to its original glory, not changing a thing except the rugs and the upholstery. The Wreck Bar fits into the hotel’s new decor perfectly, and Marina the Fire Eating Mermaid and her pod of beauties swim their show to a packed house every Friday Night, year round. A true success story about blending the old with the new. Maybe the owners of the Fairmont need to take a trip to South Florida, huh?